But the difficulty in labeling roundabout a NOOB lies in the difference among the three terms for circles into which traffic enters and from which it emerges. Wikipedia observes: “In the U.S., traffic engineers use the term roundabout for intersections in which entering traffic must yield to traffic already in the circle, reserving the term traffic circle for those in which entering traffic is controlled by stop signs, traffic signals, or is not formally controlled.” Or, in New England, rotary. Complicating matters further, roundabouts are apparently on the way to supplanting rotaries and traffic circles in the U.S. A 2009 BBC piece focused on the town of Carmel, Indiana, which has built more than 80 roundabouts under the leadership of its mayor, a fervent proponent of the concept, and bids fair to become the Milton Keynes of the Midwest–that English city apparently being celebrated for its roundabouts. So maybe my town isn’t building a rotary or a traffic circle but a roundabout and only a roundabout. And maybe roundabout isn’t a NOOB but rather a NOOBT–that is, a Not One-Off British Thing. I will let you know. Traffic engineers use the term ‘modern roundabout’ to distinguish the current, state of the art, design from past attempts to reduce delay that failed on the safety front. In the case of safety, size matters. While the US and GB began with large diameter circles, using freeway on-ramp and merging rationales, the US abandoned the concept due to high crash numbers. The UK stuck with it and developed the smaller version, a design refined in France and Australia, that the US is now re-importing. http://www.fhwa.dot.gov has a video about modern roundabouts that is mostly accurate (http://www.youtube.com/watch?v=uhHzly_6lWM ). How on earth do you have high crash numbers on roundabouts… unless people ignore the rules? Slow moving traffic all coming from the same direction – its one of the safest pieces of road design. Having never seen one of these structures in real life, I think I’d call it by whatever name my local government promoted it by. Nice dangler with the OED. As opposed to smaller in color? TeleNav, an iPhone app that provides spoken driving directions, which I have so far used only in California uses the term roundabout. Amusingly, I decided to buy the app because of my initial experience using a GPS system in south England last fall, where “roundabout” was such a commonly used term it brought about laughter after a while. In 1976-9 I was driving a lorry (=truck) from Scotland to England and picked up two hitchhikers, one from California, one from the Mid-West. The latter commented on the number of gyratory junctions we met; she’d never seen them in the US. She called them traffic circles, though she also knew the term ‘rotaries’; she laughed at ’roundabout’, which she associated only with children’s playgrounds. The Californian was aware of the other terms, but called them roundabouts and had seen them at home. They were both surprised to find US English could vary from place to place. When we started with roundabouts c. 1926, the Home Office wanted to call them “gyratory circuses”. It was an American journalist who suggested “roundabout”. 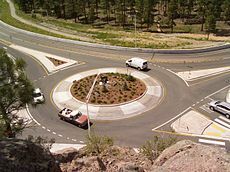 I was under the impression that actual roundabouts were not used in the US, since they are the phrase ‘traffic circle’ filled me with revoltion, I really did not like that at all. While I concede that at least you have an instant distinction between the fairground/playground ride and the road junction I assert that the context should hardly ever allow for confusion. In the UK ‘Take a left at the roundabout’ might only cause confusion if maneuvering a vehicle through a playground. BTW is it acceptable for Americans to take a left, go straight on or take a right at a traffic circle or would you always use the ordinal exit number, ‘take the first exit’, both are acceptable in the UK. I understand that some satnavs will actually give you both types of directions (I have a cheap satnav that will only give me ordinal exits). That should have read “roundabout” when you choose a UK voice. That little thing in the picture at the start of this post is not a roundabout: THIS http://en.wikipedia.org/wiki/Magic_Roundabout_(Swindon) , is a roundabout. Both ’roundabout’ and ‘island’ are used colloquially (perhaps regional). There’s not a clear distinction, but the larger ones are more likely to be called islands- ones with grass and plantings in the middle, or that are sufficiently big you can’t see all the way round them. It’s not exclusive, though, and you could encounter either in mini form. Roundabout is what your satnav and signposts would say, definitely. I don’t know about the first printed use in English, but I do know about the first actual traffic roundabout in England… because my town, Letchworth Garden City, has it. And its dates from about 1906.